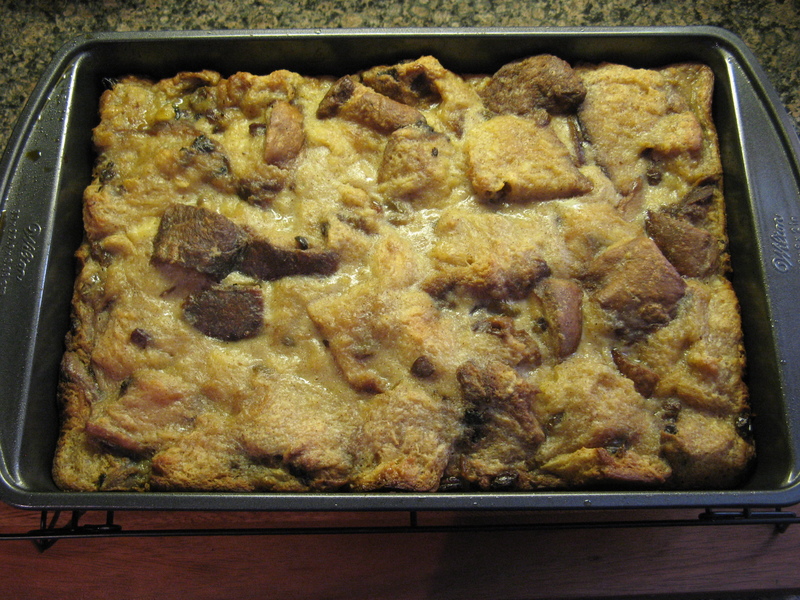 Customarily bread pudding is made with day old (or even older) stale bread… I think this where some people get turned off from eating or even trying it. The idea that something has to go “old” to be turned into something delicious is a bit of an oxymoron. 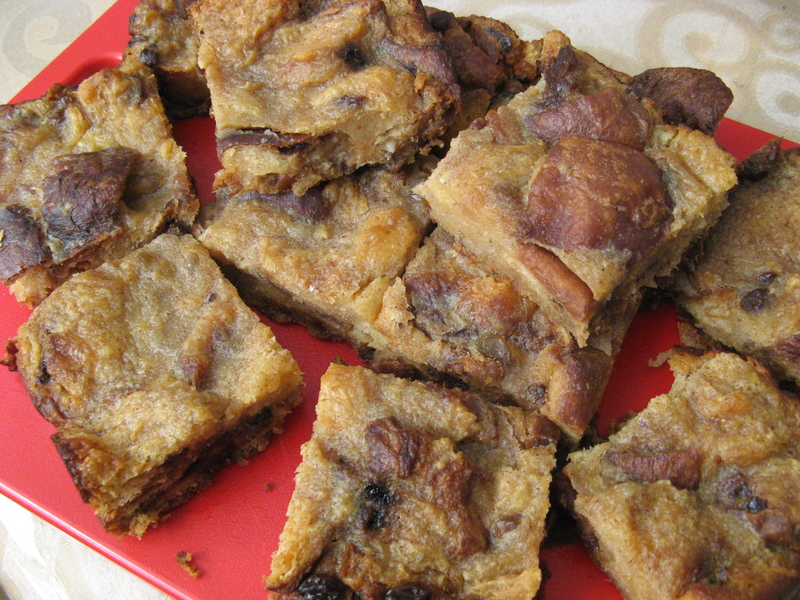 Well, if this is what your apprehension is to trying or making bread pudding today I have a recipe for you that uses panettone, an Italian sweet bread along the lines of a fruit cake, but, definitely not as a dense. And since the holidays – yes, I said the “H” word in September – are just around the corner you’ll be seeing those lovely boxes of panettone everywhere soon enough. To begin I cubed a 2lb. round panettone and spread it on a baking sheet and lightly toasted it in a 350 F oven for 10 minutes. Once cooled I put the cubes in a large bowl. In a medium bowl I whisked together eggs, sugar, melted butter, cinnamon, nutmeg, and vanilla extract. I then slowly whisked in warmed heavy cream – you don’t want to add the heavy cream too quickly as you may end up with scrambled eggs – and continued whisking the mixture until the sugar had dissolved. 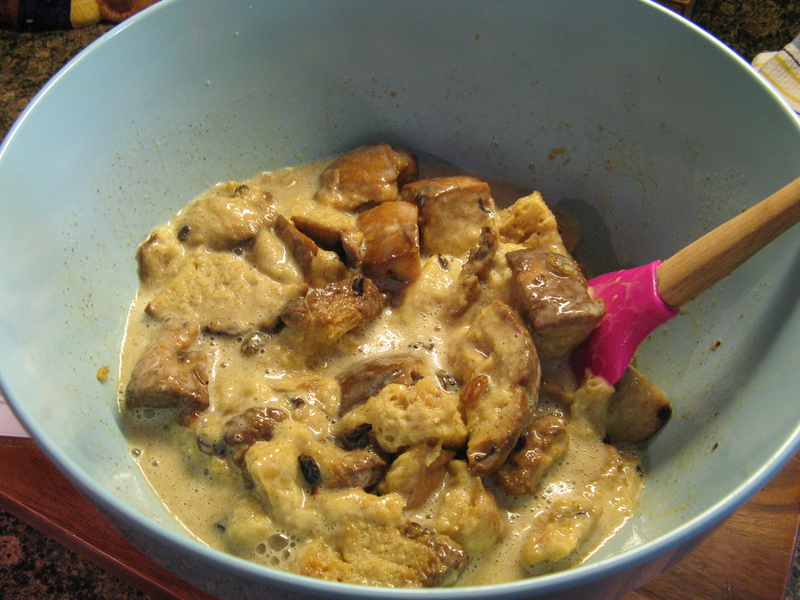 I poured the egg mixture over the cubed panettone along with some golden raisins. After folding all of the ingredients together, making sure that the panettone had soaked in the egg mixture well, I let the mixture stand for 20 minutes. Next, I transferred the mixture to a buttered 9 x 13 inch baking dish and baked it in the oven for 30 minutes, covered with aluminum foil. After removing the aluminum foil I baked it for another 10 minutes. After removing it from the oven I let it cool completely on a wire rack. Once cooled I transferred it to a cutting board and cut some pretty healthy pieces. 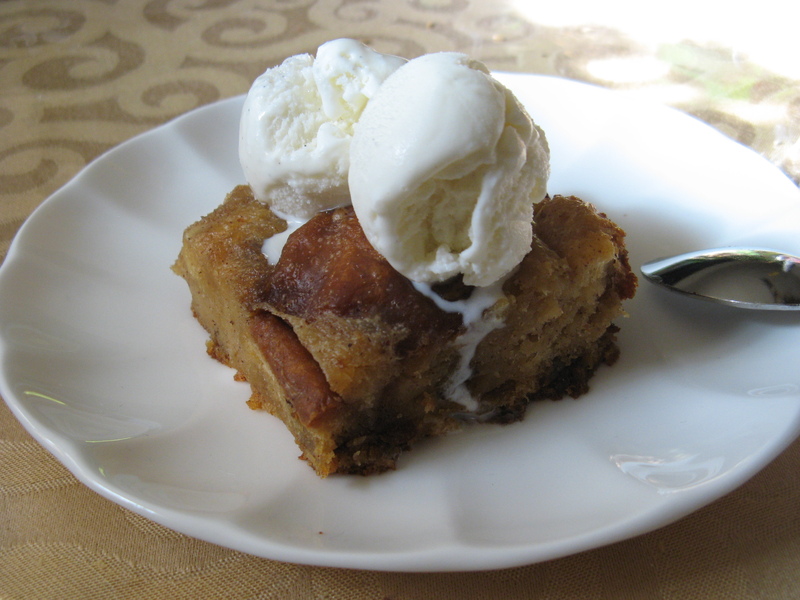 And while this bread pudding it delicious on its own due to the deliciousness of the panettone itself and the addition of extra raisins, cinnamon and nutmeg it’s even better when warmed and topped with a scoop or two of vanilla ice cream! Preheat an oven to 350 F and butter (you can also use a cooking spray) a 9 x 13 inch baking dish. 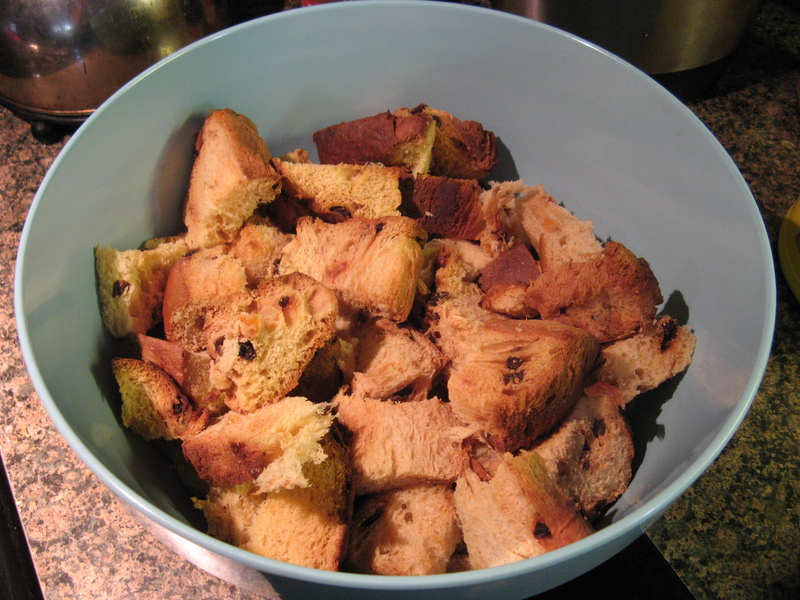 After the panettone cubes have cooled place them in a large bowl. In a medium sized bowl whisk together the eggs, sugar, butter, cinnamon, nutmeg and vanilla extract. 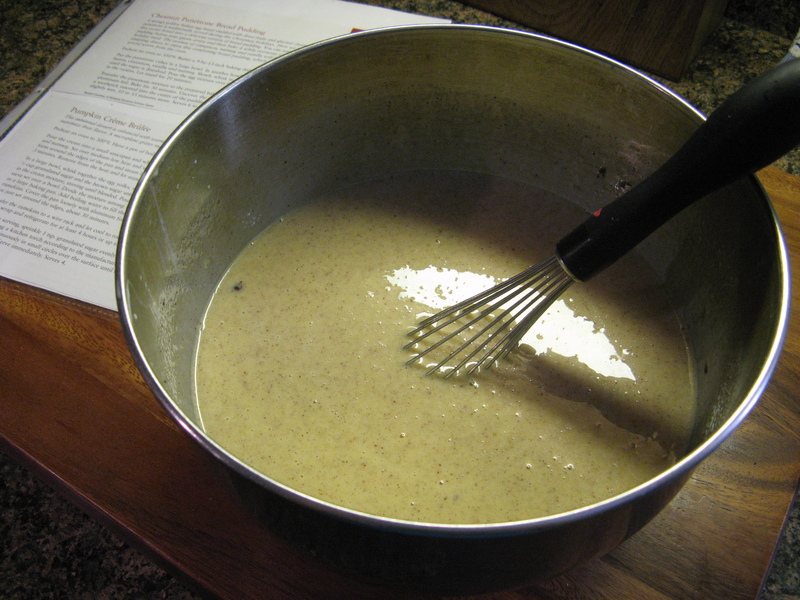 Slowly whisk in the heavy cream, whisking until the sugar has completely dissolved. 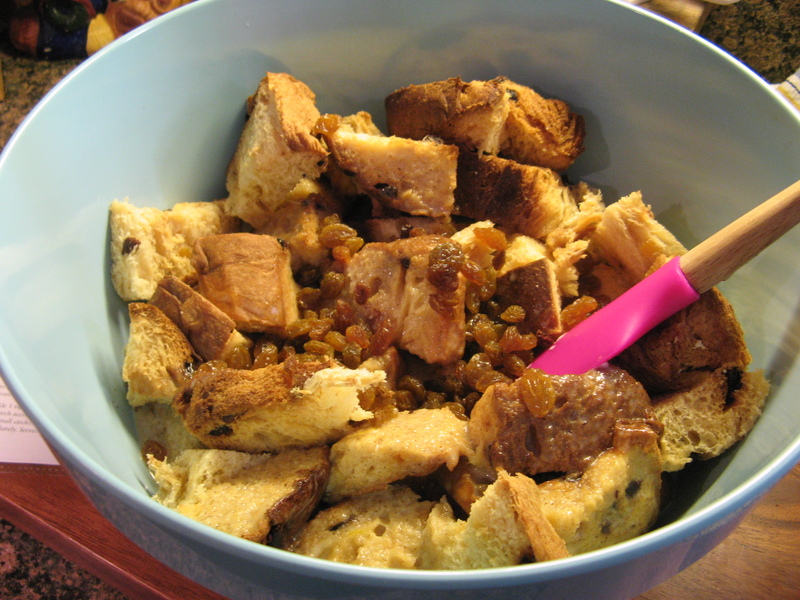 Pour the mixture over the panettone cubes, and then add in the raisins. Fold all of the ingredients together and let stand for 20 minutes. Transfer the panettone mixture to the prepared baking dish and cover with aluminum foil and bake for 30 minutes. Remove the foil and bake for another 10 -15 minutes; until a toothpick inserted in the center of the pudding comes out clean but is still slightly wet.